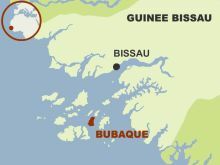 Guinea Bissau is a small country in West Africa, the same size as Belgium or Massachusetts, wedged between Senegal on Northwest and between Guinea Conakry on Southeast. The bijagos archipelago, an area of approximately 80x80km, starts at about 20km from the coast and spreads up to 100km offshore. In 1456, the Venetian navigator Cada Mosto mentioned the existence of these islands for the first time. 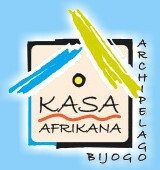 In 2009, the archipelago is no longer to discover and tourism expansion has become its greatest asset. Only 18 out of the 84 islands that compose the archipelago are permanently inhabited. 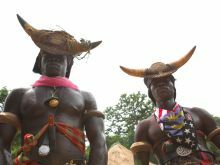 The Bijagos channels will remind you of the first discoveries and you will feel like a pioneer when treading the shiny sand and the desert creeks or when following the paths leading to the heart of the forest where one can, still today, attend to the ancestral rituals of animist initiations. 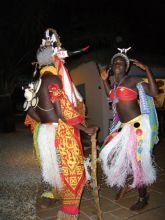 The Bijagos islands play an integral part in the Guinea Bissau territory and covers 1625km. It is composed of a dust of small islands on a bedrock of sedimentary origin. 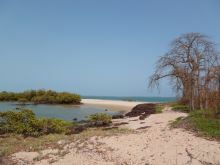 Case in point, the country area increases by 20per cent at low tide because of the high tides' great amplitude between the islands. The beaches are very large at low tide. These lands are very fertile and the pure and fresh water is accessible almost everywhere if you dig a well. The last census revealed that about 25,000 people lived in the archipelago. The population is friendly but very poor so if you want to please people you can bring clothes, notebooks and pens for the children but also drugs (antibiotics, analgesics, anti-inflammatory, antipyretics and anti-allergics).